When I was in Eighth Grade I was the starting point guard of my school basketball team. For those of you who aren’t familiar with basketball the point guard is the player who dribbles the ball up the court and calls the plays. I remember at recess we would play basketball day-in and day-out three times a day as long as there wasn’t any snow on the ground. Believe it or not the other kids used to call me Kobe. As in Kobe Bryant. Basketball Championship winning Kobe Bryant! Before I continue on there is something you should know. Back in the day I was playing basketball when I was 4 feet 11 inches tall. Remember, this is a sport for tall people. Anyways, lets fast forward 10 years. I am in my final year of University at Nipissing. It’s gym class and today’s lesson is on basketball. I am instantly reminded of my glory days and how I was able to command the court. I ran over to the rack, grabbed a ball and began firing. With each passing shot I began to notice something. I wasn’t very good at basketball anymore. So what happened? I thought about it long and hard and came to two conclusions. The first being that I haven’t played basketball since Grade Eight and the second being that I have grown over a foot and some change in height in that time span. For those of you who don’t know, I am an Education Student and part of my teaching placement involved me coaching a small team of pond hockey players today. 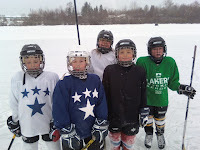 A squad of 4 boys and 1 girl took to the ice in a display of skill unlike any other. I jumped and cheered as they glided along the ice. Thinking nostalgically about the days when I used to play my basketball with my friends. What I am trying to say is. As we grow older we forget to do the activities that we used to have all the time in the world for. Back in Grade Eight I couldn’t imagine a day when I wouldn’t play basketball. Maybe for you it was hopscotch, jump rope, handball, tag, etc., but one thing is for sure: Adults aren’t playing. Use my basketball as an example and go out there and try something fun. Maybe it’s throwing on a pair of skates. Or, perhaps you want to re-connect with your thrill for nicky nicky nine door. Whatever you do, just remember to have fun. And! Don’t just do it because I told you so. Remember there is a little kid inside who wants to see it happen too. Hey Sean you are so right. Some of the best fun was our 8:30 am Monday morning Gym class last term. A bunch of adults running around playing toilet tag, you don't see that everyday. What struck me the most was how sad we were when that class ended. It was like finding something you lost years ago, having it for a while and then losing it again. I am going to go find it again!!!!! By the way, great job with the blog. Keep it up! I had this same feeling the other day... about reading. When you're a kid, you are given time every day to silent read. You make frequent trips to the library and participate in book orders every month. Why does that all stop once we reach adulthood?